What did you have for lunch today? A chicken breast? A cup of yogurt? A ready-to-drink diet shake? If you enjoyed your lunch, you may have thanked the cook or decided to buy that brand again. What you probably didn’t realize is how much you might owe a laser sensor, a puff of air and a panel of experts for your tasty meal. In Jean-Francois Meullenet’s laboratory at the University of Arkansas, people taste food, all sorts of food, and their likes, dislikes and insights can lead to millions of good lunches, with yogurt that appeals to American palates and consistently tender chicken. The rheology and sensory research program coordinated by Meullenet, an associate professor of food science, addresses the challenges the food industry faces and provides basic information on the sensory qualities of food — factors such as appearance, aroma, flavor and texture that add up to a satisfying meal. Meullenet weighs the opinions of average consumers and the conclusions of a professional descriptive panel to develop sophisticated analytical tools usable in product development or in a food-processing plant. Three decades ago, Meullenet explained, food testing was frequently used without a clear idea of what the industry was trying to achieve. For each research project, a consumer panel is assembled from a database of 1,500 individuals who have completed a questionnaire detailing personal information and consumption habits. Consumer panelists are asked for opinions and are not asked to be descriptive. Experience has shown that 60 consumer panelists are sufficient for a valid sample, although at times the researcher may request more panelists to match a previous research sample. Because the database is rich with details of likes and dislikes, researchers can assemble a consumer panel with a relatively narrow focus. For example for a recent panel, the lab was able to find 65 consumers who like to drink muscadine juice. In 1996, the UA sensory research program added a professional sensory panel, which has now grown to 15 professionals trained to quantify sensory features of foods. The panel uses a particularly flexible method, Sensory Spectrum Profiling, which allows them to describe a wide range of foods—meats and dairy products, fruits and vegetables, and grains—and to quantify their responses. The University of Arkansas is one of only a few universities in the nation with a professionally trained descriptive panel to conduct flavor and texture profiling. Most people popping the top of a ready-to-drink shake or pulling the plastic cover off a cup of yogurt are looking for a snack that tastes good, and their response might be “yum” or “yuck” or something in between. 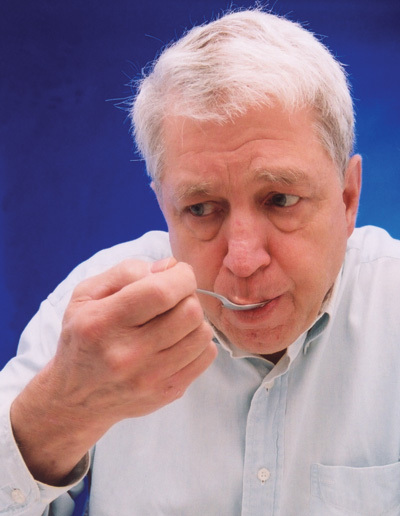 When the sensory science lab brings in a consumer panel, that is basically what they are asking the individuals to do—taste several samples of a type of food and state their preferences. When testing yogurt, the lab looks for people who buy and eat yogurt, because someone who doesn’t like the product and gives consistently negative responses can’t help make distinctions between preferences for one sample of yogurt over another. The lab staff goes to great length to insure the anonymity of product samples, so that both consumer and professional testers are focused on what they are tasting here and now, not the associations they might have with a particular brand. Setting up the yogurt taste-test presented particular challenges. On one hand, researchers wanted to leave the yogurt in its original container, in case the cup affected any aspect of the sensory experience. On the other hand, each yogurt brand can be identified with a particular cup shape and size. 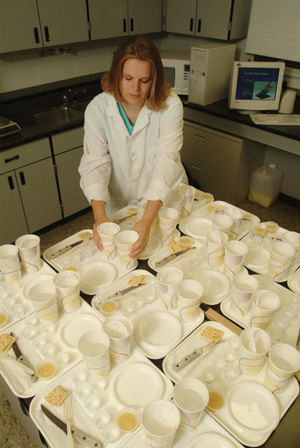 The lab staff devised a bulky cardboard holder that masked the shape of the original cup and offered an opening just big enough for a tester’s spoon. The professional sensory panelists have an entirely different job than the consumers. Professional panelists don’t talk about likes and dislikes. They pay close attention to what they perceive and to quantifying what their senses tell them about a product. How sweet does it taste? How much musty aroma do they detect? How chalky is the texture—a 6.0 or a 7.5? Profiling begins with the panel as a group developing a ballot of descriptive terms particular to the subject product along with a group consensus of how to rank the intensity of each factor, using agreed-upon reference points. Later during the actual testing, panelists will work individually and without conferring with each other to assign an intensity rating for each factor based on the references. During one ballot development, lab manager Tonya Priesmeyer walked the professional panel through referencing for textures. In an earlier meeting, the panel had identified a host of tastes, aromas and textures related to a ready-to-drink diet beverage. As graduate students distributed trays of samples, Priesmeyer led a discussion of the comparative degrees of various aspects of texture. Erin Long, a professional sensory panelist with 12 years’ experience, says that putting together the ballot is the most difficult and time-consuming part of the work. They must develop a heightened awareness of what they are actually eating and smelling, not what they might think is there. Panelist Brenda Birkinshay, a 13-year veteran, has seen how the mind can be tricky. “Sometimes people associate food from the past with what they are tasting. Like with turkey, they think there must be sage,” she said. At the same time, associations are important in isolating characteristics. While panelists do their best to arrive at consensus, Birkinshay has learned that complete agreement is not always possible or necessarily desirable. Besides being able to reach consensus with others, a good panelist also must be able to hold on to independent observations. Once everyone could feel the chalkiness of blended yogurt, the panel had a reference point: blended yogurt has been assigned an intensity of 7.5 for chalkiness. Then panelists sipped about half a spoonful of the beverage sample, sat thoughtfully for a moment and jotted down a number. A quick review of the ratings assigned by the panelists showed that they had achieved a similar understanding of the levels of intensity for chalkiness and produced an average number for future reference. In the same way, they established references for other features of texture, such as “mouth coat,” the amount of residue left after expectorating a sample, or “viscosity,” the rate at which the sample flowed into the mouth. Throughout the process, the panelists talked with each other and lab staff, requested additional samples for reference points and worked to translate what they were experiencing when they took the food into their mouths. During sensory testing, the room was very quiet. The time for consensus was past, as each panelist made an individual assessment. This time the subject was muscadine juice, and the panel considered factors related to taste, aroma and aftertaste. In addition to a sample of juice, each panelist’s tray contained cups of reference substances, such as a solution of sucrose, as a reminder of the standard intensity ratings. At times, the process looked like a wine tasting, albeit with plastic cups, as panelists sniffed and swirled the juice samples. Then a sip, a thoughtful moment, and a quick expectoration followed by noting a number on the ballot. A woman pinched her nose to isolate elements of taste from aromatics. A man stopped to think, checked back with one of the references, and made his judgment. Meullenet brings an unusual set of interests and skills to sensory research. He earned a doctorate in food science and technology at the University of Georgia, which has a large research center. His undergraduate degree, from a French university, is in mathematics, and his food science training was in food engineering. He is particularly interested in statistics and in understanding how to use data to make decisions — an uncommon focus among food scientists. Meullenet uses advanced modeling techniques to correlate the professional panel’s numbers and consumer panel’s thumbs-up and thumbs-down. Preference mapping identifies the optimal sensory profile of a particular product. The results guide the development of better food products or of efficient instrumental methods for predicting the sensory properties of a food, methods that industry employees can use in the factory or mobile lab to make informed decisions and monitor quality. For example, instrumental methods incorporating advanced modeling techniques such as artificial neural networks and fuzzy logic can be used to predict food texture from mechanical measurements. If Meullenet and his staff joined you for lunch, you might see them chewing their chicken thoughtfully with one question in mind: Is it tender? The increased demand for skinless, boneless chicken breasts has presented the poultry industry with the problem of toughness. How do they make sure that the package of chicken breasts you pick up at the grocery store will consistently have four tender filets? Meullenet explained that tough chicken breasts are a product of modern chicken processing meeting the demand for a particular piece of the bird. “Fifty years ago there was no problem with tenderness because we cooked the whole carcass at once, as a roast or boiled chicken. When a filet is cut from the carcass too early, the piece will be tough,” Meullenet said. Immediately after the chicken is killed, there is still energy in the carcass that causes contraction of muscles. As long as those muscles are still attached to bone, as they are with an intact carcass, then there is resistance to the contraction and the muscles relax gradually. But if deboning takes place before the muscles have relaxed, the meat of the chicken breast will be tough. Correlating the results of consumer testing and the professional panel’s results showed that deboning a bird four to six hours after killing produced an acceptable rate of tenderness, especially when the time stretched toward six hours. But it quickly gets more complicated. Four to six hours doesn’t fit well with the demands of the poultry processing plant. To keep the processing line moving briskly and smoothly, the industry would like to debone birds at two hours. Meullenet said that food scientists have learned that two hours is “the absolute worst time” if the goal is tender chicken. The problem then became how to meet the goal of providing consumers with consistently tender chicken breasts while running an efficient processing line. It turns out that birds dissipate their leftover energy at different rates, so 50 percent are ready to be deboned at three hours. The question is, which 50 percent? Meullenet and colleague Casey Owens, assistant professor in poultry science, considered ways to test the bird on the line to determine tenderness. Meullenet assumed that the contracted muscle might reflect light differently than the relaxed muscle. And using near infrared reflectants, that is, sending a beam of infrared light to the surface of the meat and measuring the wavelength, worked well. Unfortunately, the cost per production line made this solution too costly to implement. Then their students gave him an idea: The students were processing a lot of chicken in the lab and had made a game of predicting toughness. “They were doing reasonably well. So, I asked them how they based their decisions. It was the bulges and firmness,” Meullenet said. With that information, he began to concentrate on the filets and on finding a way to measure their shape and firmness during processing. By using a laser distance sensor, the researchers have been able to test the shape of the filet with 80 percent accuracy. To be commercially useful, they needed to get better than 90 percent accuracy, and to do that they needed to measure firmness. Touching the filets with a contact probe presented a food safety issue, so that was ruled out. Firmness, they discovered, can be determined by a simple puff of air. In a procedure similar to the standard air-puff eye test, a jet of air shoots at the filet to measure deformation. Meullenet contacted Mark Swaney, a research associate with the UA Engineering Research Center, who designed a simple machine to simultaneously beam a laser sensor and shoot a puff of air. They are fine-tuning the process, running samples and tweaking logarithms to work towards increasingly accurate classification with a system that accommodates the restrictions of the processing line. In the end, they hope to see four tender chicken breasts in each grocery store four-pack. Because the people who monitor food quality don’t typically have Meullenet’s background in statistics, he and Rui Xiong, a post-doctoral associate, are developing a user-friendly software system. Running under the readily available Excel application, the software allows industry employees to use familiar sensory language, rather than statistical language, to analyze sensory data. “The original software work was done with a post-doctoral student and a graduate student. It is difficult to find the type of student interested in this area because it really requires a statistician, and they are not always interested in food science,” Meullenet said. To further develop the software, he has shared portions of it with researchers in the United States and internationally. Of the 150 copies he has distributed, one went to a luxury car manufacturer, which has applied the software to its own consumer and expert testing aimed at determining the optimal engine sounds for luxury vehicles and sports cars. From beginning to end, the work of the rheology and sensory research program is based on people. The preferences of average people are quantified by the descriptions of professional testers and correlated through advanced mathematical modeling to develop practical tools for food processors, all with one goal. In the end, it all comes back to producing a satisfying lunch.